LayoutManager – Measures and positions item views within a RecyclerView and manages the policy for view recycling. ItemDecoration – Allows an app to add special drawing and layout offsets to specific views for drawing dividers between items, highlights, and visual grouping boundaries. As this figure illustrates, the LayoutManager can be thought of as the intermediary between the Adapter and the RecyclerView. The LayoutManager makes calls into Adapter methods on behalf of the RecyclerView. For example, the LayoutManager calls an Adapter method when it is time to create a new view for a particular item position in the RecyclerView. The Adapter inflates the layout for that item and creates a ViewHolder instance (not shown) to cache references to the views at that position. When the LayoutManager calls the Adapter to bind a particular item to the data set, the Adapter locates the data for that item, retrieves it from the data set, and copies it to the associated item view. RecyclerView.Adapter – Provides a binding from your app's data set (which is specific to your app) to item views that are displayed within the RecyclerView. The adapter knows how to associate each item-view position in the RecyclerView to a specific location in the data source. In addition, the adapter handles the layout of the contents within each individual item view and creates the view holder for each view. The adapter also reports item-click events that are detected by the item view. RecyclerView.ViewHolder – Caches references to the views in your item layout file so that resource lookups are not repeated unnecessarily. The view holder also arranges for item-click events to be forwarded to the adapter when a user taps the view-holder's associated item view. If you do not extend ItemDecoration and ItemAnimator, RecyclerView uses default implementations. This guide does not explain how to create custom ItemDecoration and ItemAnimator classes; for more information about these classes, see RecyclerView.ItemDecoration and RecyclerView.ItemAnimator. The recycled view goes on-screen as the user scrolls the RecyclerView to the next item in the list. Meanwhile, another view scrolls out of sight and is recycled according to the above steps. The layout manager is responsible for positioning items in the RecyclerView display; it determines the presentation type (a list or a grid), the orientation (whether items are displayed vertically or horizontally), and which direction items should be displayed (in normal order or in reverse order). The layout manager is also responsible for calculating the size and position of each item in the RecycleView display. The layout manager has an additional purpose: it determines the policy for when to recycle item views that are no longer visible to the user. 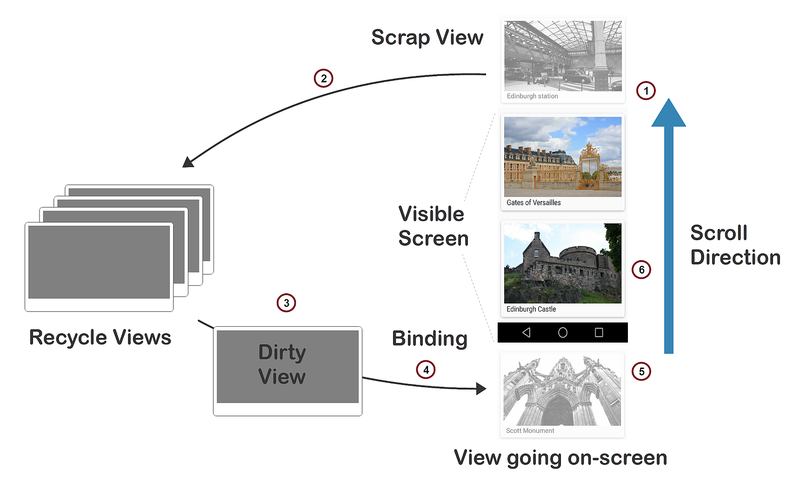 Because the layout manager is aware of which views are visible (and which are not), it is in the best position to decide when a view can be recycled. To recycle a view, the layout manager typically makes calls to the adapter to replace the contents of a recycled view with different data, as described previously in How View Recycling Works. To specify the layout manager, instantiate your chosen layout manager and pass it to the SetLayoutManager method. Note that you must specify the layout manager – RecyclerView does not select a predefined layout manager by default. For more information about the layout manager, see the RecyclerView.LayoutManager class reference. 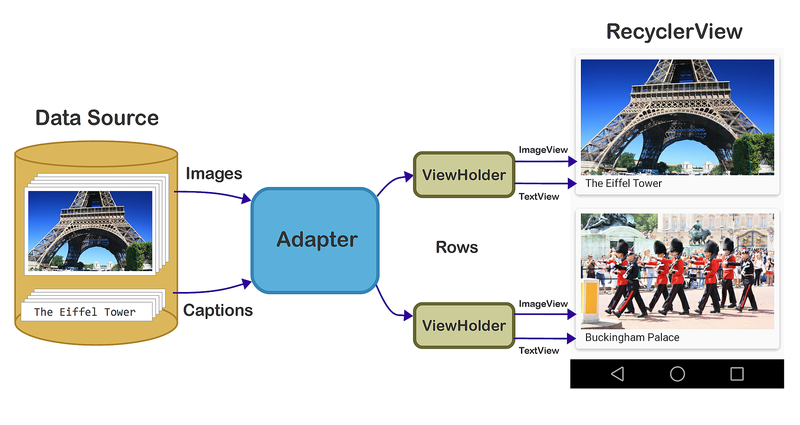 A detailed example of a ViewHolder implementation is presented in A Basic RecyclerView Example. For more information about RecyclerView.ViewHolder, see the RecyclerView.ViewHolder class reference. Most of the "heavy-lifting" of the RecyclerView integration code takes place in the adapter. RecyclerView requires that you provide an adapter derived from RecyclerView.Adapter to access your data source and populate each item with content from the data source. Because the data source is app-specific, you must implement adapter functionality that understands how to access your data. The adapter extracts information from the data source and loads it into each item in the RecyclerView collection. The adapter loads each RecyclerView row with data for a particular row item. For row position P, for example, the adapter locates the associated data at position P within the data source and copies this data to the row item at position P in the RecyclerView collection. In the above drawing, for example, the adapter uses the view holder to lookup the references for the ImageView and TextView at that position so it doesn't have to repeatedly call FindViewById for those views as the user scrolls through the collection and reuses views. The layout manager calls these methods while it is positioning items within the RecyclerView. If you know exactly how your data set has changed, you can call the appropriate methods above to refresh RecyclerView in the most efficient manner. If you do not know exactly how your data set has changed, you can call NotifyDataSetChanged, which is far less efficient because RecyclerView must refresh all the views that are visible to the user. For more information about these methods, see RecyclerView.Adapter. In the next topic, A Basic RecyclerView Example, an example app is implemented to demonstrate real code examples of the parts and functionality outlined above.